She'll make a grand entrance riding this stunning horse-drawn carriage! 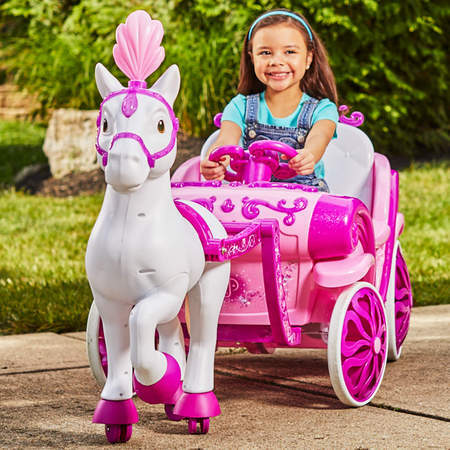 Watch as your child wisps away on grand adventures with this charming Disney Princess Royal Horse and Carriage Battery-Powered Ride-On! Press the red push button and the "foot-pedal" style accelerator to start the ride. As your child steers the beautiful heart-shaped wheel, the royal horse glides on durable casters and turns to lead the carriage. 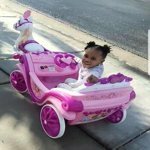 This dazzling royal carriage is ornately designed with graphics of her favorite Disney Princesses: Belle, Cinderella, Rapunzel, Jasmine, Aurora, and Tiana. Plus, there's additional features that make this ride-on extra special: fun Disney Princess sounds, a spacious glove box, a beverage holder, doors that open and close, and even more. The elegant white horse has a play mane and tail which is so much fun to braid and brush into various styles! She can press on the steering wheel's heart-shaped button to play three delightful Disney Princess sounds to accompany her ride. The glove box has plenty of room to carry precious gems and other royal treasures (toys not included). Your child will adore opening and closing the intricately detailed carriage doors. Plus, she can place her favorite drink inside the beverage holder. With Huffy EZ Build, only from Huffy, it's Quick and Easy to Assemble! There's no tools required to build this battery-powered ride-on. 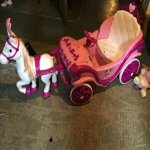 Just 4 easy steps: snap together the wheels, plug in the wiring and then snap together the steering wheel, plug in and snap together the seat, and insert the left and right supports for the Disney Princess royal horse. No tools, no hassle. It's that simple! Plus, the horse folds for convenient storage inside a garage or basement— that's something you'll really appreciate. This is so unique, Pretty and cool! 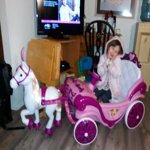 My little princess couldnt get enough of this Carriage. I love the little horse In front, it makes it really stand out. I got it on a good black Friday deal as well couldnt pass it up. Not mention setting up was a breeze didnt take no more than 30 min. Highly reccomend this ride on..Every little princess deserves a horse and carriage!! My 4 year old daughter loves this. 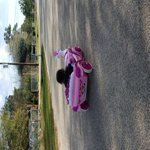 My brother put it together in less than 30 minutes and we took it out for a ride down our street and it rode great. My daughter was so happy. The horse's feet do get stuck on rocks, grass and dirt at times but no big deal, I walked side by side with her and would lift the horse if it got stuck. 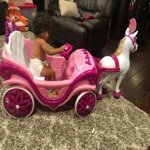 It is a unique design and my baby feels like a princess when she is riding it. The royal horse carriage is beautiful. My 4 year old granddaughter loves it. I put a 3 year warranty on it, because she will be able to ride in it for a few years. Lots of room in it, perfect. My 2 year old absolutely loves it!!! Very easy for to navigate and her 4 year old brother can ride in with her as well. Highly recommended!!! Got this for my 3 year olds birthday. she absolutely loves it! And it is great. only complaint is the horse. it's super cute, but it seems to get in the way a lot. such as driving in the grass, or over something small like a water hose...the horses feet get held up on it but the carriage doesn't stop unless she takes her foot off the peddle. so now a couple of the horses feet are bent, which creates more issues. so we ended up taking the horse off. It came 5 days early but the box is damaged and it was opened. Not very happy about that. It is way too big for me to load it up in my suv and return on my own so not sure what ima do. Vary disappointing though. It's a birthday present for my soon to be 6 year old daughter. She will love it. But I'm worried it has been used and isn't going to work. We received this is the mail for my daughters 3rd birthday. When we went to assemble the product it didn't have a steering will in the box.